The origin of the Hindu temple is said to be the ancient basic circle of stones within which one cherished holy relics, human or divine. It is the Hindu temple where the contact between man and gods take place and it is also where a man progresses from the world of illusion to knowledge and truth and thus, a temple is not only a place to worship but an object to worship as well (Michell 61-62). A Hindu temple not only shows unique architecture but also symbolizes ideas characteristic in its structure, which are usually related to the common practice of people residing around it. A pilgrimage or visit to a temple is undertaken for the purpose of looking at it (darsana) (Kramrisch 8). The evolution of Hindu temples occurred over many centuries due to differing views between the rulers of the Indian sub-continent. Emperor Asoka is credited with ordering the construction of the first significant stone structures in India around 3rd century, BCE. Religious architecture can be tracked back to the Vedic time (1500 – 700 BCE) and practices of temple worship can be traced back to texts from the Puranas and earlier (Michell 63-64). The construction of the temples however was on a small scale back then, which included materials such as timber, baked clay bricks and mud. Caves were naturally the earliest shrines on record and from the 4th to 7th century, a classical “golden period” of art and architecture emerged in India. It was this period in which temple building activities grew rapidly all over the country (Singh and Sharma 17). When kings conquered other kingdoms for the purpose of expansion, they reintegrated their thoughts into carvings of antique superstructures. Some stages of architectural patterns still survive to the present day. 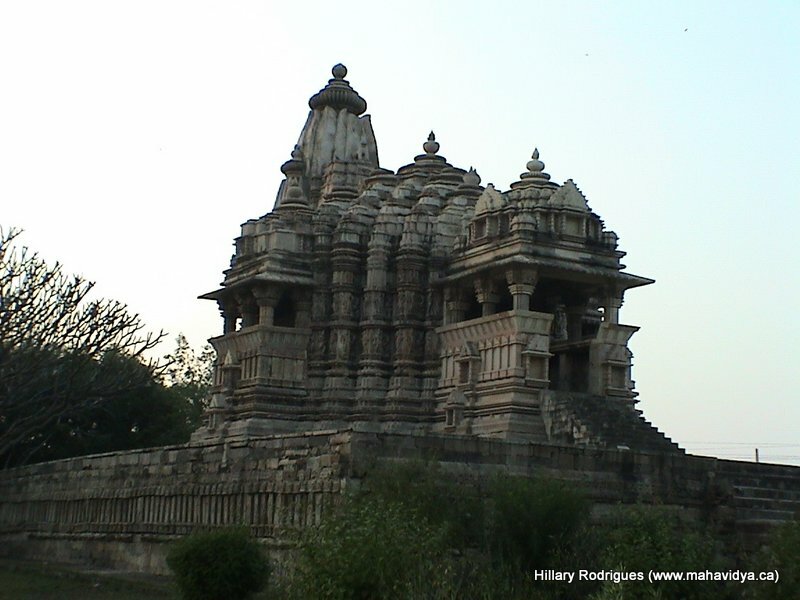 A Nagara style temple would generally stand on a high platform (jagati) made of stone bricks, with several mouldings. The identification of the temple with a mountain is specific and the superstructure is known as a “mountain peak” [For more information and visuals, see Michell 69, Fig. 62]. The jagati represents the feet of a man. Over jagati, there is a smaller platform of stones (pitha). Over the pitha, there rises an even smaller platform (adhisthana), which is the base of the superstructure of the temple. The pillars and walls of the temple are raised on the adhisthana (Singh and Sharma 18). The Nagara style is not native to the mountainous region and some believe it was introduced in the late Gupta period. The Nagara, also known as the sikhara (mountain peak) type, can be divided into three sub-groups: The first is the Phamsana Type. This is the earliest known type of sikhara. It is usually a pyramidal structure divided into seven, nine and eleven tiers. The towering sikhara is crowned by an amalaka, which is a stone disk believed to represent the deity of the temple. A kalasam, a finial from which the temple banner is hung, crowns the amalaka itself. Illustrations of the Phamsana Type can be viewed at the Siva temple at Camunda, the Nrshimha temple at Bharmaur and many others (Singh and Sharma 19). The second is the Latina Type. This type represents most of the stone temples of Nagara style in Himachal Pradesh and is believed to have emerged at the beginning of the 8th century. The Latina Type temples are curvilinear in nature, following their trademark triratha plan. “The central bands of the superstructure are tall spines of web patterns cast over receding cornices – the creepers (latas) of the Nagara temple’s Latina formula” (Meister 256). An example of this temple would be the Rudranath (Gopinath) temple in Uttrakhand. The third is the Valabhi Type. These temples have a rectangular ground plan, a doorway on one of its longer sides, and a semi-cylindrical sikhara. No Valabhi Types are found in Himachal Pradesh but there are several examples of this type across India. [See Singh and Sharma (2008) for extensive information on the Valabhi Type]. The Nagara style has 2 basic components. The first is garbhagra, a sanctum with only one entrance, in which the image of the main deity is installed (Singh and Sharma 27). “The garbhagrha consists of 4×4 = 16 squares, which is equivalent to the Brahmasthana” (Thakur 264). The second component is known as mandapa, a porch in front of the garbhagrha, typically exposed from three sides for the worshippers to assemble for worship. [Refer to Singh and Sharma (2008) for more information on this component of the Nagara style]. Various examples of diverse ideologies of different emperors regarding Nagara temple architecture will be explored in the following cases. The northern style under the Guptas and their successors (400 CE – 600 CE) portrayed a square sanctuary that connected with a pillared porch. The roof of the sanctuary consisted of horizontal stone slabs and this part lacked a tower. A horizontal molding serves as a cornice on the plain wall surfaces. Uprights that margin the doorway are divided into vertical bands, which continue over the lintel. The porch had columns divided into square, octagonal and sixteen-sided sections with undergrowth centers supporting brackets engraved with pairs of seated animals (Michell 94). Rock-cut temples were common under the Early Chalukyas, Kalachuris and Rashtrakutas (500 CE – 700 CE). These cave temples contain pillared halls with small chambers cut into the posterior walls. The halls have columnar arrangements, with varieties such as fluted shafts or panels of relief carvings; cushion capitals are also employed (Michell 98, Fig. 41). Together with the doorways, these columns display clear northern stylistic characteristics. The brackets of the outer columns of these caves are fashioned to depict amorous couples beneath trees, a motif considered particularly appropriate for the entrance of a temple (Michell 99, Fig. 42). Another variation of the rock-cut temples places the sanctuary in the middle of the columnar hall instead of the posterior wall. The lack of the external access via a flight of steps, sometimes guarded by lions, is characteristic of these caves. The Elephanta cave near Mumbai resembles this type of architecture and one of the main focal points is a three-headed, major sculpture of Lord Siva, also known as the Great Lord, Mahesha (Michell 98-101). Other carved panels nearby are devoted to scenes from the mythology of Siva. The northern style under the Kalingas and Eastern Gangas (700 CE – 1200 CE) can be seen in some of the Orissan temples such as the Parashurameshvara temple. “The emphasis on the horizontal courses employed in the superstructure of the sanctuary and roof of the adjoining hall is one of their main characteristics. Another key characteristic is the contrast between the vertical profile of the superstructure, curving only at the very top, and the pyramid-like arrangement of hall roof” (Michell 110). In the Vairal Deul temple in Bhubaneshwar, the sanctuary is rectangular and is positioned on a transverse axis to the adjoining hall. The walls of the sanctuary are divided into projections with carved panels, which lead into the lower parts of the superstructure (Michell 111, Fig. 51). As centuries went by, stylistic developments were occurring in the Indian sub-continent. Further stylistic advances may be detected in the Lingaraja temple in Bhubasneshwar (Michell 113, Fig. 53). “The outer walls are divided by a horizontal molding into two registers, as are the tiers of the hall roof, which is surmounted by an inverted bell-shaped fluted form” (Michell 112). This temple was enlarged by the addition of two more halls along the principal axis of the temple to create a sequence of successive interior spaces that was to be copied in later Orissan temples. The northern style under the Pratiharas and Chandellas (700 CE – 1000 CE) erected several small temples at various sites, which resembled typical northern stylistic features such as a square sanctuary with projecting niches, carved doorways, and towers with curved profile. Distinct stylistic innovations appeared by the 9th century and one temple built with similar designs is the Telika Mandir at Gwalior (Michell 116, Fig. 57). This temple’s rectangular sanctuary raises the superstructure into a massive dome. The unique expansions on the end of the temple project complex interlocking horseshoe arched designs. These expansions spread onto the horizontal divisions of the tower serving as pediments above the doorways (Michell 116, Fig. 58). When the Chandella kingdom replaced the Pratihara rule, several new temples with unique architectural designs were built in Khajuraho, one of the kingdom’s capital cities. Their tall slender columns characterize the interiors of the Khajuraho temples. Auspicious females support the foliage design that exists on the brackets of these columns. The dome-like ceiling above the central spaces of the porches and halls provides the Khajuraho temples’ chief interest. The ceilings are usually sculptured with cusps that rise in diminishing circles to an overhanging lotus bed. The doorway to this sanctuary is characteristic of a northern manner and the images on the outer walls are floodlit by the lighting from the open balconies (Michell 122, Fig. 63). The northern style under the Maitrakas and Solankis (700 CE – 1200 CE) erected temples that were small buildings with diminishing stepped mouldings adorned with bold horseshoe arched ‘windows’. The Maitraka rulers built temples near Gujarat after gaining control of the region in the 7th century. Under the Solanki kings, who took over the Maitrakas, Gujarat developed prolific regional architecture style. The Surya temple at Modhera is widely known for its unique two structures and an artificial tank that resides along the east-west axis (Michell 124, Fig. 64). The hall of this temple has its long side positioned towards the principal emphasis of the temple with its plan spreading outwards in a number of different projections. The balcony slabs have panels with attendant figures carved upon and the brackets of the outer columns of the temple support an overhanging cave (Michel 125, Fig. 65). The temple itself consists of a hall and sanctuary surrounded on three sides by an ambulatory passageway. The earliest stone Hindu temples in Kashmir and other Himalayan valleys (700 CE – modern period) can be traced back to the 8th century when Lalitaditya ruled the region. The lower valleys of the Himalayas mark the most northerly extension of Hindu architecture. The Surya temple at Martand was also erected under his patronage. A trilobe arch that frames the doorway is characteristic of the Kashmir style and is well-illustrated in the Siva temple at Pandrethan. The temple has a square sanctuary with entrances on all four sides. A Kashmir characteristic trilobe arch frames the opening. The sloping roof of this temple is divided into two tiers with horseshoe headed ‘windows’. The ceiling of the temple has lotus designs with attendant figures engraved upon (Michell 128, Fig. 67). In the nearby regions of Kulu, Kangra and Chamba, timber and brick buildings dominate the temple forms. Stone is sometimes retained for the doorways and walls of the shrines in these temples. The characteristic northern style can be found in the decoration of the doorframes in these temples. Two of the earliest surviving brick temples in North India – the Laksmana temple at Sirpur and the Rajivalocana temple at Rajim in south Kosala – preserve superstructures suggestive as much of “Kutina” forms as of the final Latina formula of North Indian Nagara temples (Meister 277, Figs. 21-23). These structures show large single candrasala (“moon-hall”) windows progressing up the central offset of the sikhara and karna-kutas which, while pulled in to the body of the superstructure, have not been absorbed fully into the mass nor condensed beyond recognition. On both temples, these kutas are full miniature structures, presented as small-pillared pavilions with simple superstructures (Meister 288, Figs. 21, 27). In comparison to the Dravidian style, the Indo-European or Nagara style is a curvilinear, beehive shaped tower rather than a pyramid consisting of smaller storeys of smaller pavilions. The base plan itself is usually square in the northern style compared to the pyramidal vimana put on top of the garbhagrha [For information on the Dravidian style, see Michell 127-137]. In modern day India, new temples continue to be erected and older buildings refurbished. Compared to the southern temple style, northern temples are the product of a more discontinuous tradition (Michell 183-184). A temple is a place where one strives for the self-realization, where one finds their true self. It is a place where one may understand their atman/ jiva and possibly, Brahman. Kramrisch, Stella (1976) The Hindu Temple Vol. I. Delhi: Motilal Banarsidass. Meister, Michael W. (1988-1989) Prasada as Palace: Kuṭina Origins of the Nagara Temple. Zurich: Artibus Asiae. Michell, George (1988) The Hindu Temple: An Introduction to its Meaning and Forms. New York: Harper & Row Publishers. Singh, K.A., and Shuchita Sharma (eds.) (2008) Temple Architecture of the Western Himalayas – Ravi and Beas Valley. Delhi: Sundeep Prakashan. Thakur, Laxman S. (1990) Application of Vastupuraṣamaṇḍala in the Indian Temple Architecture: An Analysis of the Nagara Temple Plans of Himachal Pradesh. Zurich: Artibus Asiae. Article written by: Sidhesh Mohak (April 2015) who is solely responsible for its content.